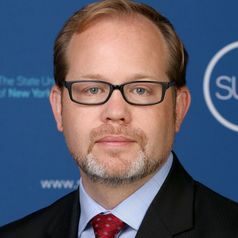 Jason E. Lane is interim dean of the School of Education at the University at Albany, State University of New York. He is also Professor of Educational Policy & Leadership, senior fellow of the Rockefeller Institute of Government, and founding director of SUNY’s Academic and Innovative Leadership (SAIL) Institute. An accomplished education leader and noted scholar of higher education, Dean Lane’s scholarly expertise focuses on the leadership and governance of higher education, particularly as it relates to the emerging relationship between higher education, public policy, and globalization. His research has led him to work and consult with institutions, organizations, and governments across the country and around the world. He currently co-leads Taking Student Success to Scale (TS3) a national network of 23 systems of higher education working to implement evidence-based practices to improve student completion and was invited by the American Council on Education to lead a master class on using data analytics in leadership to college and university presidents. He has written more than 75 journal articles, book chapters, and policy reports; and authored or edited 10 books, including Academic Leadership and Governance of Higher Education (Stylus Press), Multi-National Colleges and Universities: Leadership and Administration of International Branch Campuses (Jossey-Bass), Building Smarter Universities (SUNY Press), and Colleges and Universities as Economic Drivers (SUNY Press). He has received more than $1 million in grants from funders including the Bill and Melinda Gates Foundation and the New York State Education Department. As co-director of the Cross-Border Education Research Team, his work in documenting and analyzing international branch campuses has been foundational in the developing research field of transnational education. A Fulbright New Century Scholar, he has conducted research in more than 30 countries on the development of multi-national colleges and universities. His research in this area has received numerous awards, including the Award for Outstanding Contributions to International Education Research from the Association for the Study of Higher Education. He has also served on the boards of the Comparative and International Education Society (CIES), Council for International Higher Education (CIHE), the Gulf Comparative Education Society (GCES), and SUNY Korea. Since 2016, Professor Lane has served as the chair of the Department of Educational Policy & Leadership. During his tenure he shepherded the change of the department’s name, led the development of several new academic programs including an undergraduate minor in leadership, master’s in higher education, and graduate certificates in community college leadership and international education management. In addition, he has served as a fellow for academic innovation in the Office of the Provost; founding executive director of SUNY’s Academic and Innovative Leadership (SAIL) Institute, a higher education leadership think tank and provider of professional development; co-chair of the University’s Self-Study committee for the upcoming Middle States reaccreditation; and co-leader of the Hispanic Leadership Institute, an initiative of Governor Cuomo to strengthen and diversify the academic leadership pipeline. Professor Lane also held several senior leadership roles with the State University of New York system administration, including vice provost for academic planning and strategic leadership and senior associate vice chancellor for the State University of New York, where he was responsible for the development and implementation of academic, economic, global, and leadership initiatives across the system. His responsibilities included guiding educator preparation for the system, managing SUNY’s Urban Teacher Education Center in NYC; serving on the steering committee for the Master Teacher program, and co-leading the Teach-NY initiative.